Since I was a child of 6 (when my father brought home an Acorn Electron) I've been following Acorn Machines. In 1999 I finished a game called Starhawk on an A610. It didn't have so many levels but was pretty nice. Then, unfortunately I bought a PC which I wanted for the superior games - forgot about RISC OS and ARM completely. I learnt a game development language and now I am a game designer/developer, though yesterday I have bought an A600 on eBay because I wish to revisit ARM desktops and RISC OS. I prefer the Acorn Community as the feeling is mostly politeness and intelligence. The only drawback is most of us are English, which is not a problem (being English myself) but the community is inevitably smaller. Does anyone see advantages in this? I mean to recode - with a new level editor, maybe some more graphics - not make a conversion as such. I'd like your opinions about said project, any guidance would be welcome in terms of requirements or how to code efficiently using an Acorn. Heroboy from "Hero: The Realm"
Last edited by Square Mezzmer on Fri Mar 16, 2018 12:24 am, edited 2 times in total. Re: Hi, just acquired an A600 Archimedes. Welcome to this amazing forum! I like the fact that's the community is small as it's a tighter knit group of great contributors. Welcome to the Forum, Square Mezzmer . . . Enjoy . . . Looking forward to your conversions. I'm sure you'll get lots of assistance, if needed! p.s. The link to your portfolio seems to be broken. Your game looks really good - which language are you writing it in? Do you mean a Risc PC 600 or have I missed something? @Multiwizard Haha, thanks. Hello Indeed! @Rob I'm writing it in a mix of Acorn BASIC and some bits of machine code (hopefully). I'm more scripty as I'm a Game Designer more than a Game Programmer if you get me. I've gotten the hang of scripting the code in a C based Game Dev language, having written Hero: The Realm twice in my lifetime so I know the ultimate shape of it. I'm glad to have so many responses to my first thread here! now to get your games onto your electron! I lik the cheering spectators and the way the snakes look shocked that you are going to turn them into prizes. I don't know about English helping, English people are in the minority in my department, but we still all speak English, so I doubt it makes much difference. It arrived. I spent some time cleaning everything, the old guy had let it all get a bit dirty - to my shock! 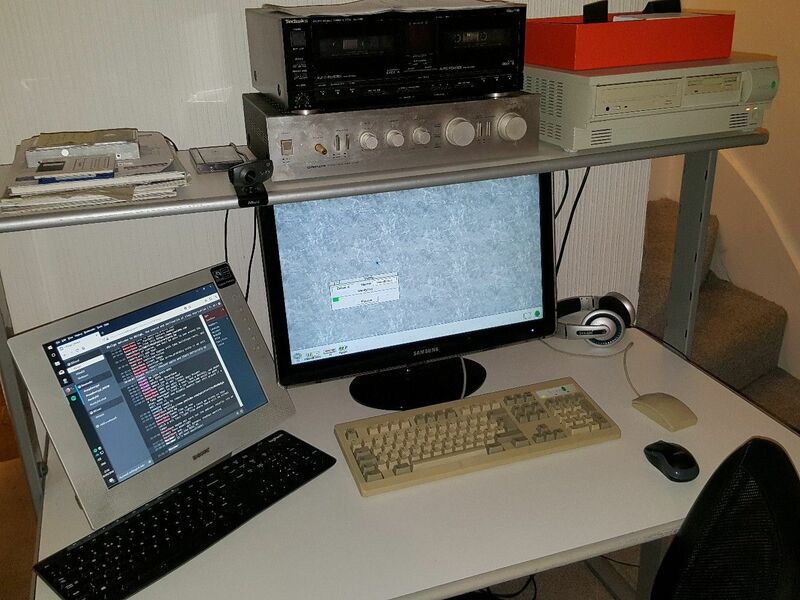 I now need a monitor switch of some kind to get my main monitor to change from RISC PC to my Windows Machine. Also I need a serial port adapter so I can load data via an SDCard. I don't know RISCPC 600 maximum drive size via the serial port. I am about to search for a compatible serial port - sdcard loader online! @tricky Thanks for the compliments, I like that effect too. @Bryan/helpful: Cheers for the links! Thanks. That's great, but how will I know if I have an ethernet card? Temporary solution would be a USB external floppy disk drive. I hope I can get that and blank discs at Maplins tomorrow. Additional: The RISC PC started fouling up on video, so I turned off and left it for a while. Next time I tried this 2010(?) widescreen monitor, it didn't detect the signal(!) I'll keep you posted if my RISC PC is okay, I found a simple flatscreen monitor to use in the meantime but no suitable monitor cable available. It'll have an ethernet port on the back if you do. Usually both 10baseT and 10base2 but could just be one or the other. Usual methods won't work but if I format a disk at the command line with Windows 10 and a cheap external usb floppy drive - I can load files to the RISC PC. I was given instructions for a 720K type format but I just doubled the amount of sectors (N) from 9 to 18 and rather luckily (but logically) it worked. Now I can finally load things to my RISC PC. I didn't have a CD/DVD-ROM in my Windows desktop or an internal floppy drive so under a tight budget this is like a breakthrough for me. Daniel J. I'm confused to what this actually is. Will it provide me an ethernet slot or wifi? Otherwise I'd best get an sdcard solution as I'm thinking down those lines. That will give you ethernet. If you want to use something a bit memorysticky, as I said it'll read PC format discs, but you can go the Gotek-Flashfloppy route for a second floppy drive? danielj wrote: That will give you ethernet. Ah now, I just purchased RISC OS 5 rom. Once this is fitted (I've been warned) some networking may be unavailable. As long as I can connect to my Windows 10 PC I'd be happy. Do you happen to know if I've scuppered myself? (I think the main networking is different in RISC OS 5). Dare I ask who suggested using RiscOS 5 on a RiscPC? If you want to use it, you should use it on a Raspberry Pi. RiscPC keep as 3.7 or, at a push, 4? Ah. I did receive the RISC OS 5 roms. I was thinking they would "better" my system or environment somehow but now I'm aware even using a StrongARM may give me software compatibility problems. Hmph. Now I have a StrongARM and now a RISC OS 5 romset to put onto ebay. Thinking of getting a Raspberry Pi for other things but may stick with my new solution 3.5 RISC OS machine for development. At least it runs everything and no problems so far (apart from sorting the hard disc problems). Also received the ethernet adaptor so will try and get a connection going in a moment with FTPc. @danielj: Thanks very much for your support!